As we can see, the Bears lined up with Martellus Bennett, Brandon Marshall and Alshon Jeffery in trips to the right, with Bennett up front, Marshall on the inside and Jeffery out wide. Buffalo has three defenders up there to cover all three. Josh Morgan is lined up wide left on his own, but he’s really only there for decoration with maybe the hope of pulling the safety deep with him on his vertical route. Jay’s initial read is to the right side, and what he does, and what his receivers do, will depend on how Buffalo reacts. After the ball is snapped, Bennett takes off on a vertical downfield, Marshall takes a step outside and also heads on a vertical route toward the sideline. Alshon Jeffery takes a step back for a possible screen, and that’s the route that sets the rest of this play in motion. 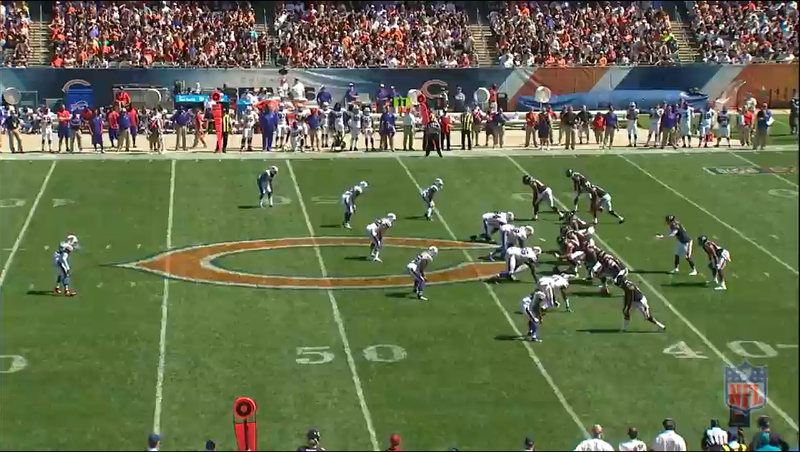 As Jeffery turns toward Cutler, the two Buffalo defenders nearest the line of scrimmage, as well as a linebacker, react and move toward him expecting the bubble screen (the red lines in the shot below). Meanwhile Marshall and Bennett continue on their routes and former Bear Corey Graham (yellow) now has two receivers to cover at the same time. When Cutler sees this he makes his decision, and makes the pass to Bennett, which is the correct read (if Cutler did anything wrong it was to react too quickly), but Bennett makes a mistake. As both Marshall and Bennett continue their routes, my guess based on the throw Jay makes is that Bennett is supposed to cut his route off while Marshall continues down the sideline. Jay could opt to go deep to Marshall here as he has single coverage should Graham follow him (and he probably would have), but even on first down it looks as though Jay chose the gimme option…if Bennett had cut his route short like he was supposed to. Instead Bennett keeps heading upfield, and Corey Graham suddenly goes from having to make a very hard decision to an incredibly easy interception. This is what it looked like when Jay released the ball. 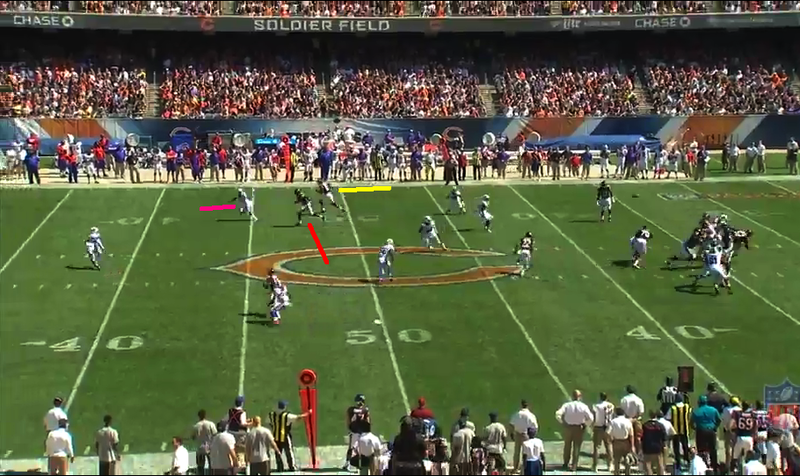 Bennett (red) doesn’t cut off his route and if he does it’s an easy grab, a first down, and possibly more should he get past Graham (purple) and get outside with Brandon Marshall (yellow) still there to block the deep safety the Bills had. It was the safe option for Jay to make, and it could have actually resulted in a touchdown. 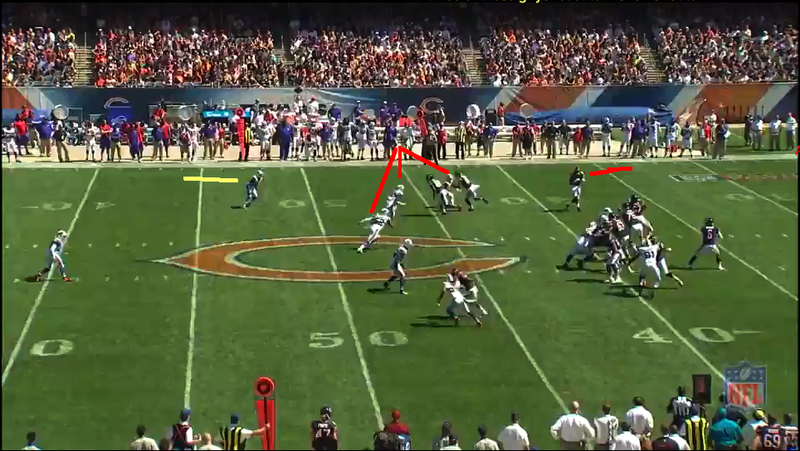 Instead, Bennett kept heading upfield and Corey Graham picked off the pass, got a nice return, and a personal foul set Buffalo up at the Bears 7. They’d score a play later to extend their lead to 17-7 and put the Bears in a hole. 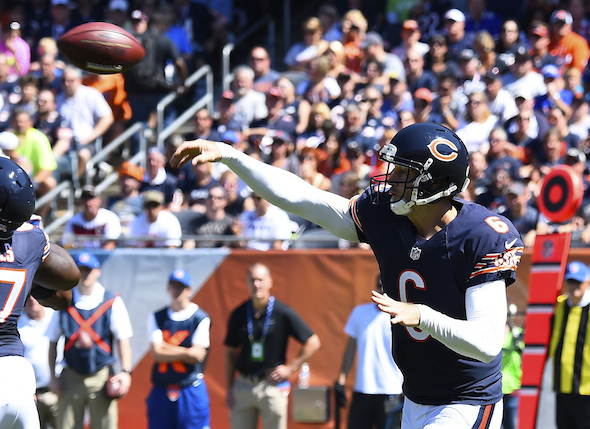 On Cutler’s second interception, there’s not much to explain. It’s possible he could have run for the first down, and even if he didn’t get there, tucking the ball and running was the correct option. Instead, he hesitated, panicked and threw the pass right into the waiting arms and belly of a nose tackle while trying to force the pass to Bennett. That was a terrible decision. That was the Jay Cutler who deserves criticism, and the one that’s drawn a lot of criticism over the years in Chicago. Overall, Cutler didn’t have a great game. His PFF grade of -1.9 was tied with Michael Spurlock for the lowest grade of any Bears player on offense. He handled things poorly after the game by saying that fans and media don’t actually know what was supposed to happen on any given play, and it made things worse on him. On this interception, he was right. Initially, we didn’t know what was supposed to happen, but now we do. Martellus Bennett wasn’t lying after the game. That one was on him. But if Jay keeps making mistakes like the one he did on the second interception at key times in the game, and he keeps having the same reaction to questions after the game, the perception isn’t going to change. It’s going to be his fault, whether it really was or not. This entry was posted in Chicago Bears and tagged Alshon Jeffery, Brandon Marshall, Jay Cutler, Josh Morgan, Martellus Bennett by Tom Fornelli. Bookmark the permalink.